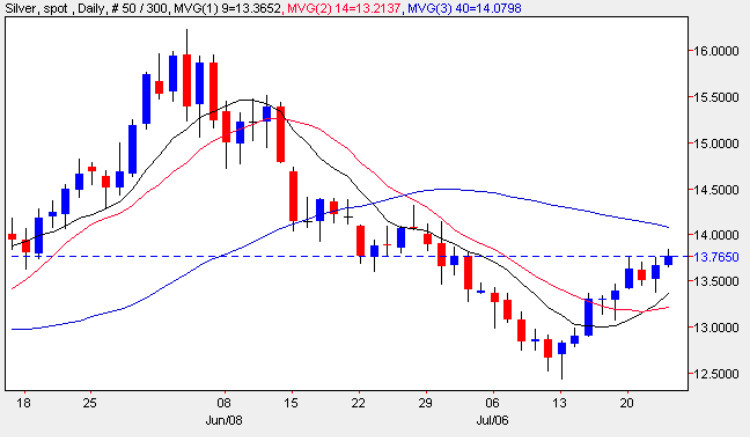 The price of silver closed marginally higher yesterday, ending the trading session with a narrow spread doji candle, with a deeper wick to the lower side which seemed to find some support from the 9 day moving average. In common with many other markets, the price of silver ebbed and flowed throughout the day as Ben Bernanke’s comments were first absorbed, then analysed and dissected for any hidden messages or signals as the the FED’s view of the current economy and their likely fiscal and monetary policy moving forward. From a technical perspective yesterday’s candle provided little in the way of any confirmation that the bullish recovery is likley to continue, and indeed the alignment of the highs of the last three days would suggest otherwise, and a very similar pattern to that on the daily gold chart. Whether this results in a short term reversal, only time will tell, but the key to any sustained move higher for the price of silver, will be a break and hold above the strong resistance in the $13.80 to $14.50 price band, coupled with silver prices crossing and holding above the 40 day moving average. Should these two factors combine, then we should see the bullish rally firmly re-established once again, with a sustained move higher in due course, which seems to be the picture for it’s more illustrious cousin, gold. In addition silver may also benefit from the general bullishness of the industrial metal sector which has seen both copper and iron ore hit fresh highs recently. Although much of the recent commodity rally has been attributed to “restocking” while prices were low there does appear to be some evidence that demand is likely to pick up towards the latter part of 2009. If this is the case then there is no reason to suppose that the price of silver should not benefit too.